RECIPE TITLE "Essential Roasted Tomato-Jalapeno suace from the stone mortar (Salsa de Melcajeta) "
... more great recipes by Rick Bayless on our GREAT CHEFS page! The first time you hear that gravelly, rock-against-rock rotation of the mortar, the first time you smell the irascible aroma of crushed roasted garlic and chiles, the first time you taste the jazz band of seasoning playing through the juicy ripe tomatoes -- you've come face to face with the real Mexico. It's a simple first step, partly because it looks like what we think of as "salsa," partly because we can find the ingredients so easily. But do go to the extra effort to buy good tomatoes. Then roast them and the garlic and chiles with a confident hand -- that's the technique that sets these flavors apart. With a lava-rock mortar from Mexico, you'll feel centuries of tradition as your hands work the ingredients together. 1. Roasting the basic ingredients. The broiler method: Lay the tomatoes on a baking sheet and place about 4 inches below a very hot broiler. Boast until blistered and blackened on one side, about 6 minutes; with a spoon or pair of tongs, flip the tomatoes and roast on the other side. The griddle method: Line a griddle or heavy skillet with aluminum foil and heat over medium. Lay the tomatoes on the foil and roast, turning several times, until blistered, blackened and softened, about 10 minutes. Don't worry if skin sticks to the foil. Cool, then peel the skins, collecting all the juices with the tomatoes. While the tomatoes are roasting, roast the chiles and unpeeled garlic directly on an ungreased griddle or heavy skillet (you already have one set up if you've griddle-roasted the tomatoes) over medium. Turn occasionally until both chiles and garlic are blackened in spots and soft, 5 to 10 minutes for the chiles, about 15 minutes for the garlic. Cool, pull the stems off the chiles and peel the papery skins from the garlic. 2. Grinding the salsa. The mortar method: In a large mortar, use the pestle to crush and grind the chiles, garlic and 1/4 teaspoon of the salt to a coarse-textured paste (this will release a wonderfully pungent aroma), paying special attention to breaking up the chile skins. A few at a time, grind in the roasted tomatoes, transferring the ground mixture to a bowl if the mortar gets unmanageably full. The food processor or blender method: In a food processor or blender, grind the chiles, garlic and 1/4 teaspoon of the salt to a coarse paste, stopping to scrape down the sides of the bowl a couple of times. Add the tomatoes and pulse a few times until you have a coarse-textured puree. Transfer the salsa to a serving bowl, and stir in any reserved tomato juices. 3. Final seasoning. In a strainer, rinse the onion under running water, shake off the excess and stir into the salsa, along with the cilantro and optional vinegar. Add water, if necessary, to give the salsa a trickish, but easily spoonable, consistency (2 to 4 tablespoons is the norm). Taste and season with salt, usually a scant 1/4 teaspoon, and the salsa's ready to serve. Advance Preparation -- This salsa comes into its own a few hours after it's finished, especially if left at room temperature. It can be made through step 2 a day or two ahead, covered and refrigerated. Add the cilantro and onion shortly before serving. Other Chiles You Can Use -- Besides jalapeño, serranos (3 to 5 for this quantity) are also classic. It's also made with habanero (1/2 to 1) or manzanos (1/2 to 1). With habaneros, this typical Yucatecan salsa, called chiltomate, is frequently made without chopped onion or cilantro and is flavored with sour orange juice in place of the cider vinegar. A Different (but Traditional) Guacamole -- Make the salsa as directed, but don't add any water. Coarsely mash 3 avocados, stir in a cup or so of the salsa, add a little more chopped cilantro if you wish, taste for salt and the guacamole is ready. Spicy Chicken "Hash" -- In a large nonstick skillet over medium heat, fry an onion (sliced) in several tablespoons of oil until golden. Add about 1 1/2 cups of the salsa and cook until thick and reduced, then stir in 3 cups of boiled-until-tender, roughly mashed red-skin potatoes. Keep frying and turning and working everything together until the potatoes brown and the mixture holds together. Stir in a cup of shredded smoked (or roasted) chicken and some chopped cilantro or green onion, warm through and the hash is ready. Falapeño-Baked Fish -- Lay four 5- or 6-ounce fillets -- such as snapper, mahimahi, grouper or bass -- in an oiled baking dish in a single layer and sprinkle with salt. Spoon 2 cups of salsa over them. Bake in a 400-degree oven until the fish just flakes when firmly pressed (it'll take about 8 minutes if your fillets are 3/4 inch thick). If you like richer flavors, sear the fillets on both sides in an oiled skillet over medium-high before laying them in the pan. If the sauce seems too juicy, pour it into a saucepan and boil gently until reduced. Sprinkle the whole dish with some chopped cilantro before serving. Those chiseled-out bowls of basalt (lava rock) called molcajetes in Mexico -- the ones that sit on counters in taquerías, home kitchens, even fancy eateries -- are so tangled up in Mexican culinary history that it's nearly impossible to think there could be a replacement. But, in all honesty, for some jobs there is. If you're talking about a chunky salsa made from roasted jalapeños, garlic and tomatoes, what you'll get from the mortar -- juicy, elegantly textured, clear in flavor -- is much better than the pulp you'll get from a blender or food processor that you've turned on and just let run. However, carefully pulsing a machine with sharp blades can yield a decent salsa. Very few cooks these days (in Mexico or beyond) use a mortar (or its larger cousin, the metate) to make dried chile sauce; the chile skins are hard to grind. A food processor works remarkably well for such a sauce, as does a blender, though the latter usually requires the addition of a little extra liquid and repeated stopping to scrape down the blender jar. For sauces thickened with nuts and seeds (like moles andpipianes), the blender works far better than the food processor because its blades go faster and can pulverize even the smallest seeds. I would be remiss if I didn't say that those who've been raised on mole de la abuelita (grandma's mole) say that when she grinds everything by hand the flavors and textures are better. This makes perfect sense: in the mortar or on the metate, you're crushing ingredients, hence extracting more flavor, rather than finely chopping them as you do in a blender. Bottom line: I have a molar and I use it for grinding spices and for certain salsas (I've noted this in the recipes). The extra muscle power I expend is easily made up for by my enjoyment of the aromas and texture. In my recipes, I call for a mortar, blender and food processor; whichever I list first is my preference. It's not likely you'll find a good, heavy molcajete made of the densest basalt (lava rock) for sale in the United States, simply because the best ones weigh and cost a lot, and there's not a huge call for them here. Lightweight "tourist" models look nice on the shelf but are so rough and porous that you'll forever be grinding grit into your food. In Mexico, I suggest you search through the markets for a stall that primarily sells mortars and metates (the sloped flat grinding stones). Choose a heavy, compact, smooth-textured mortar -- the surface should look a little like unpolished granite -- that will hold three to four cups. I am partial to the ones with a decorative pig or ram's head carved on the side. To season your molcajete, grind a handful of wet, raw rice in it once a day for several days, until you've smoothed out the roughest edges in the bowl and the rice no longer looks dirty. When grinding, hold the metlapil (the pestle) so that your fingers are parallel to its length (not wrapped around it), with the smallest end toward your palm. Keep your wrist rather loose to allow you to rotate the pestle easily around the bowl while exerting an even pressure from your palm. When making salsa in the mortar, the idea is to work the ingredients together a little at a time. Start with the hardest (or most difficult to grind) items, then, work in the softer, juicier stuff. 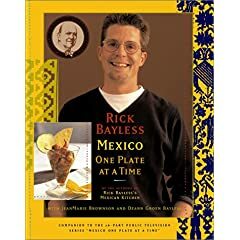 Rick Bayless has been acclaimed widely as America's foremost proponent of Mexico's thrillingly diverse cuisine. In this companion book to his 26-part Public Television series, he takes us, with boyish enthusiasm, through Mexican markets, street stalls and home kitchens to bring us the great dishes of Mexico, one "plate" at a time. And each "plate" Rick presents here is a Mexican classic. Take guacamole, for instance. After teaching us the essentials for a perfect, classic guacamole, Rick shows how to spin contemporary interpretations, like his Roasted Poblano Guacamole with garlic and parsley. Rick's cuisine is always lively, but rooted in strong traditions. Always the teacher, Rick begins each "plate" with some never-before-found features: traditional benchmarks (Rick's idea of the best guacamole), when to think of the recipes (weeknight dinners or casual party food), and advice for American cooks (Rick's insight into the ingredients that make the dish). He rounds out each "plate" with suggestions for working ahead. To complete the journey into the Mexican mindset, Rick, with help from his testers, ends each "plate" with a question-and-answer section detailing just about everything a home cook might want to know: What are the best cuts of beef for grilled tacos? The best cheeses for quesadillas? Is one grill better than another? 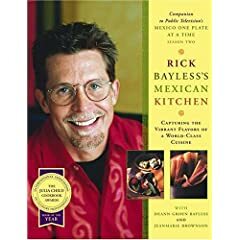 Rick draws from his years of living in Mexico, pulling us into the Mexican kitchen, to teach us how to create authentic Mexican dishes in our American kitchens. Rick is an Indiana Jones of the stove, a Julia Child of Mexican cuisine in black jeans and a T-shirt. Rick's goal: to enable folks all across the United States to create dishes that weave in the rich tapestry of Mexican flavor with ingredients that are widely available. He always provides ingredients that make the dish authentic, but he also delivers with the right substitute if an ingredient is hard to find. Experience food you can't wait to make in a new and user-friendly cookbook that contains the full range of dishes -- Starters, Snacks and Light Meals; Soups, Stews and Sides; Entrées; Desserts and Drinks. Rick serves up such classic Mexican plates as Tomatillo-Braised Pork Loin, Quick-Fried Shrimp with Sweet Toasty Garlic, Chiles Rellenos, Cheesy Enchiladas Suizas, and Mexican Vanilla-Scented Flan. And for an exciting taste of the unexpected, try Rick's contemporary interpretations of the classics -- Crispy Potato Sopes with Goat Cheese and Fresh Herbs, Grilled Salmon with Lemon-and-Thyme-Scented Salsa Veracruzana, Broiled Flank Steak with Tomato-Poblano Salsa and Rustic Cajeta Apple Tarts with Berry "Salsa." 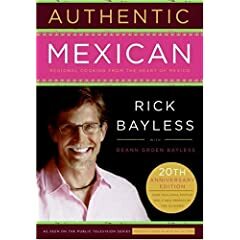 Mexican Everyday (Recipes Featured on Season 4 of the PBS-TV series In his previous books, Rick Bayless transformed America's understanding of Mexican cuisine, introducing authentic dishes and cooking methods as he walked readers through Mexican markets and street stalls. Salsas That Cook is a breakthrough in contemporary American cooking. Here, Mexico's classic salsas get put to work in our kitchens in the same way we use a variety of international condiments, from teriyaki sauce to balsamic vinegar, to enliven and redefine the flavor of many American favorites. While most of us have enjoyed salsas as chip dips, salsas show great versatility when weaving complex flavor into simple dishes, from pasta to potatoes to meats, fish and vegetables. Salsas embody the essence of Mexican flavor: the lusciousness of slow-roasted tomatoes, the full-flavored spice of chiles, the fragrance of cilantro and the mellow sweetness of garlic. 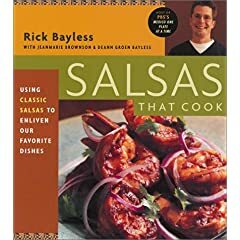 Rick Bayless, the country's leading progenitor of real Mexican cooking, writes the six salsa recipes with such detail and personality that even beginning cooks will turn out masterful creations.